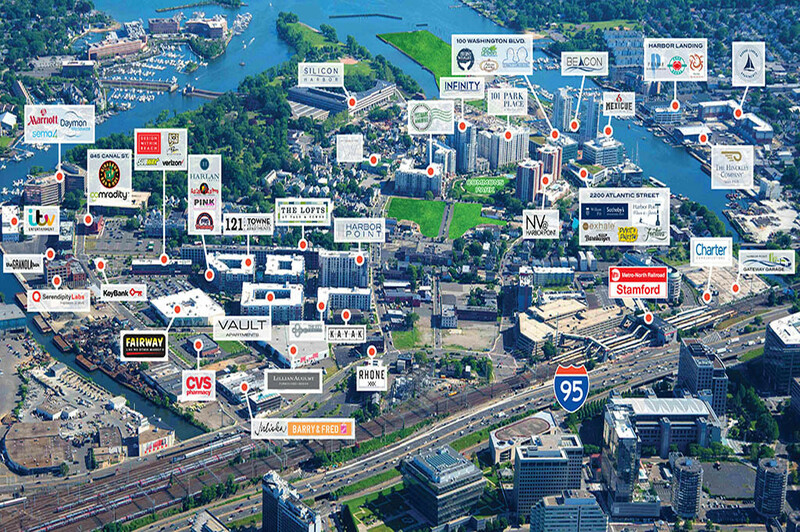 Harbor Point, the 80-acre development site originally planned more than a decade ago, comprises two main tracts of land, both old industrial sites in Stamford’s South End. To the northeast, Harbor Point is the entire old Yale & Towne factory site, roughly the block between Henry Street to the south and Market Street to the north. To the southwest, Harbor Point is the old Pitney Bowes factory site along with the so-called HELCO site, also known as Northeast Utilities or Admiral’s Wharf. The sites have been redeveloped with billions worth of rental, restaurant, retail and office space. Building and Land Technology, which bought the development from Antares, still owns the bulk Harbor Point, but has sold several buildings in the last few years. In 2016, the developer sold off much of the northeastern tract and one building in the other lot. Buildings sold include The Key at Yale & Towne, Vault Apartments, The Lofts at Yale & Towne, 111 Harbor Point and Postmark Apartments. That sale of some 1,200 apartment units was for nearly $400 million. Does Harbor Point, and BLT, pay taxes? Yes, Harbor Point and property owners within it pay city taxes, but through a more complicated system than sending the city an annual check, or seeing property taxes tacked on to a monthly mortgage payment. Harbor Point is housed within a “tax-increment financing” district, or TIF. In short, the district sold $145 million worth of bonds to improve the neighborhood’s infrastructure and now a portion — an “increment” — of all the new property taxes generated goes to pay principle and interest on those bonds. This system, although sometimes abused by municipalities, is used because a city gets dramatic improvement it can’t otherwise afford and is somewhat insulated if plans fail. Once bonds are paid off and all infrastructure is approved by the city, the city gets the full property tax payment from each property — worth far more than if it remained vacant industrial land — and takes hold of the streets and infrastructure improvements. To date, the development has paid the city $18.6 million in fees and conveyance taxes, and some $100 million in property taxes. What is Building and Land Technology’s future plans? The builder, though often tight lipped, has told neighbors and city boards general outlines of its plans for the neighborhood outside of Harbor Point. BLT is now urging Zoning and Planning board members to approve its pitch to build another high rise with some 670 units total in a complex between Woodland Avenue and Walter Wheeler Drive. The southern portion of that block was already part of Harbor Point while the northern half was once the site the B&S Carting, a garbage transfer facility. BLT bought out the trash hauler and razed the block. BLT owns another block further north. On that site — between Henry and Dock streets north and south and Garden and Atlantic streets east and west, where the old Blickensderfer factory sits — BLT Chief Operating Officer Ted Ferrarone has said the builder wants to build a mixed-use development, but has said little more. BLT is also building the Charter Communications headquarters just south of the rail lines and I-95. It’s now pitching a second building for Charter and wants to take back 500 parking spots it had pledged rail commuters. And there is the now vacant 14-acre peninsula in Stamford Harbor, site of the former boatyard BLT razed. The company has not announced plans for the site. Neighbors, through the South End’s Neighborhood Revitalization Zone, say they want BLT to stay within city zoning and planning outlines and preserve all homes and businesses within the neighborhood’s 177-acre South End Historic District.